What the Heck is a Flog? "We had heard that Wal-Mart's critics could be vicious in their attacks. Now we know those concerns were valid. And we kept our professional lives out of it, where we work and what we do for a living, because this was not about the organizations we work for, I did this blog because I thought it would make a great story. Jim did this because we live together. We took vacation time in order to make this trip. We weren't out there as representatives of our employers, or anybody at all but ourselves. So now we're being attacked. Why? Because we dared to write positive things about Wal-Mart. The people who hate Wal-Mart couldn't argue with anything we said, we were writing about real people and telling true stories." "This is so foolish on so many levels, it makes me scratch my head, everyone involved violated the basic rule: Be transparent. If you're found out, it comes back as a slap in the face." I'm kind of puzzled myself that so many big companies would think this is a good idea. Trust is a tough thing for anyone to earn, especially in the consumer - corporation relationship. I guess the best we can hope for is that others just might learn from all of these mistakes. This morning's 3 breakout sessions wrapped up this year's Saleforce.com conference, and these 3 that I attended were actually 3 of the better breakouts I saw all week. First up was the business mash-ups session on the developer track. While I'm not a developer, I'm really interested in API's and webservices functionality, especially as it related to Salesforce. There was a great presentation from infopia, and examples of how they've gone out to dozens of API's and integrated them into Salesforce for their clients. 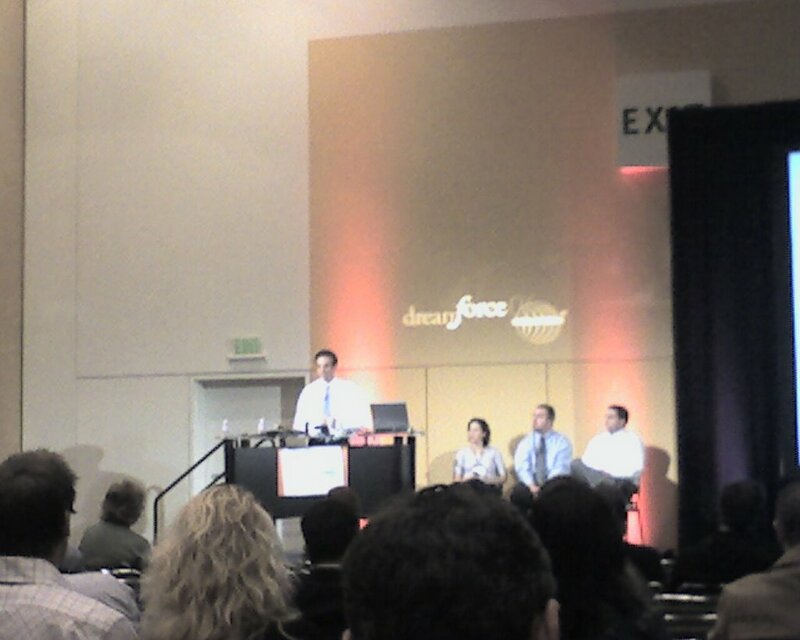 Spanning Partners also talked about integrating Google Calendar functionality within SF. The next session was the community building session that featured 2 of the best Salesforce bloggers Mark from Salesforcewatch.com and Scott from Perspectives On Salesforce and ArrowPointe Consulting. Also on the panel was Joseph from LeverageSoftware. 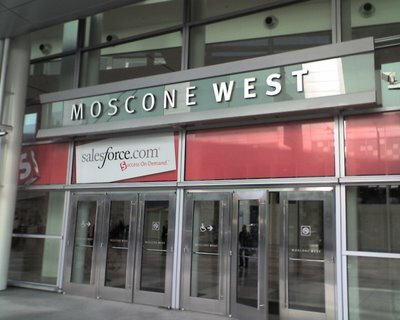 I really think the folks at Salesforce have done a great job to embrace community, especially on through the Successforce blog and on the Idea Exchange. 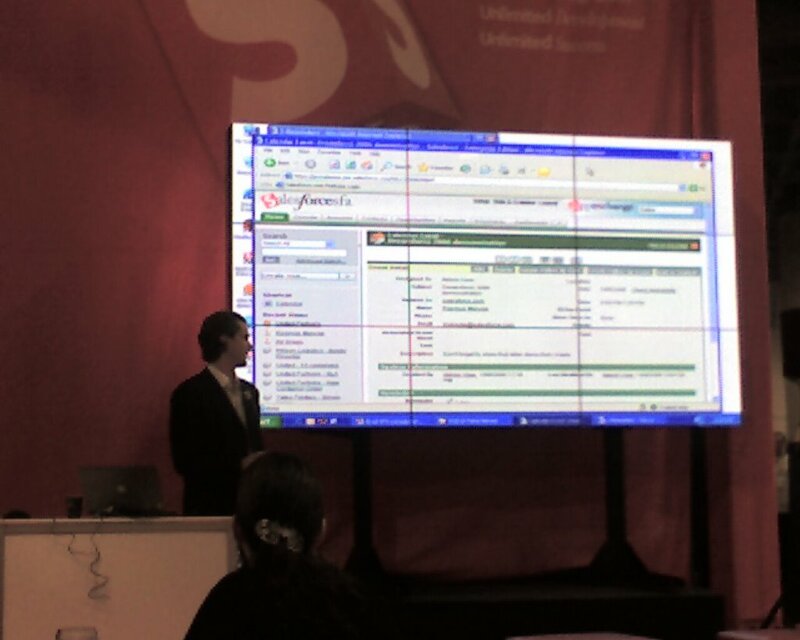 The last session of the conference for me was the professional edition roadmap presentation. 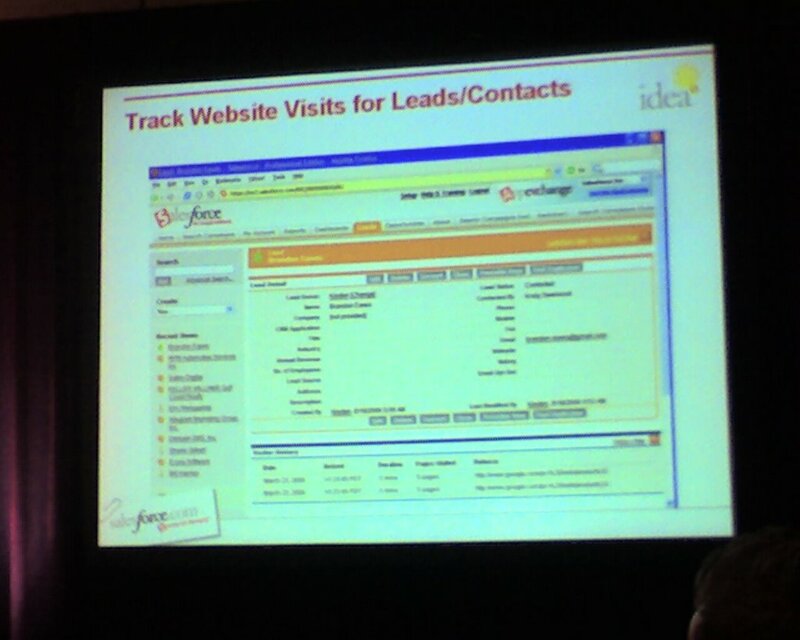 At this point we've already seen most of these ideas in previous presentations and through the idea exchange, but a couple of ideas / future rollouts grabbed my interest: marketing tracking enhancements including click tracking - for an ROI focused marketer like me, this is a big development. 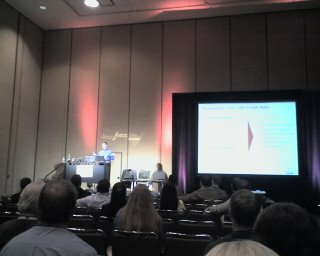 SF loves their Google adwords tracking product and I think they want to expand this into new areas. Yahoo search tracking, organic search tracking and more are being considered. Salesforce wants to enable users to understand the context in which customers are interacting with us and this is definitely a good thing. Other cool ideas include saved search history and tagging features, both of which would make it easier to find our key data. A couple of more photos, all of which and more can be found on Flickr. Marc Benioff got us started again this morning with an interesting introduction to the featured keynote General Colin Powell. General Powell got a standing ovation and was an excellent speaker. He talked for a long time and held the audience for most of that time with interesting anecdotes and the importance of corporate philanthropy, a topic that Mr. Benioff likes to remind us is covered in his new book. Powell took us through some examples of how he uses technology, and I was impressed to know that he actually understands Salesforce and its implications on the business world and government and has a great grasp on how the internet is making things move and change at a pace that humanity has never seen before. 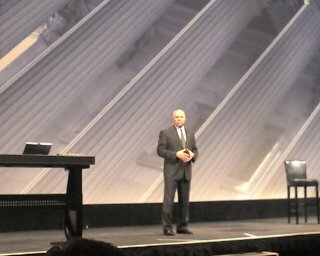 I really enjoyed his speech, but I think Powell lost most of the audience's attention when he began to explain the current political situations with various regions around the globe. At this point we had been listening to Benioff and Powell for more than 90 minutes. 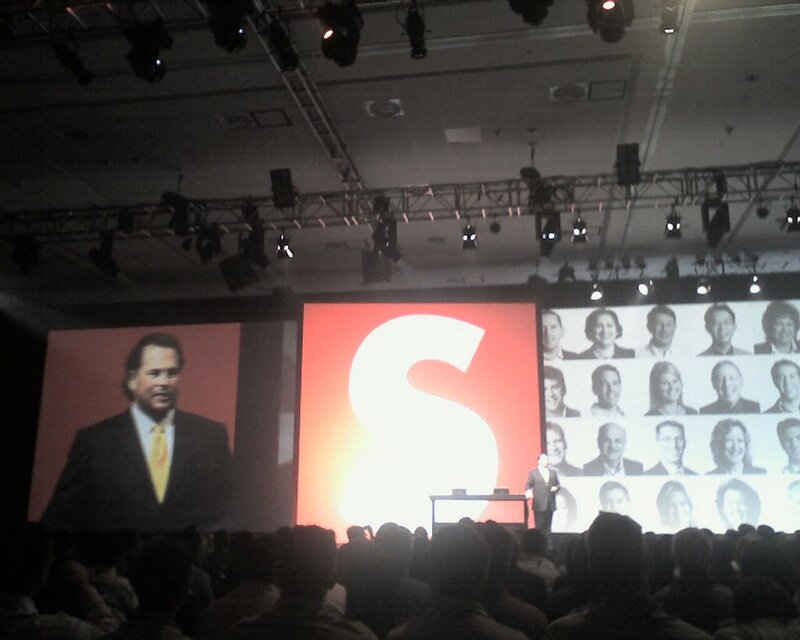 After Powell left the stage, various product demonstrations by executives from Symantec, Deutsche Bank, F5 Networks, Corporate Express, and Skype. 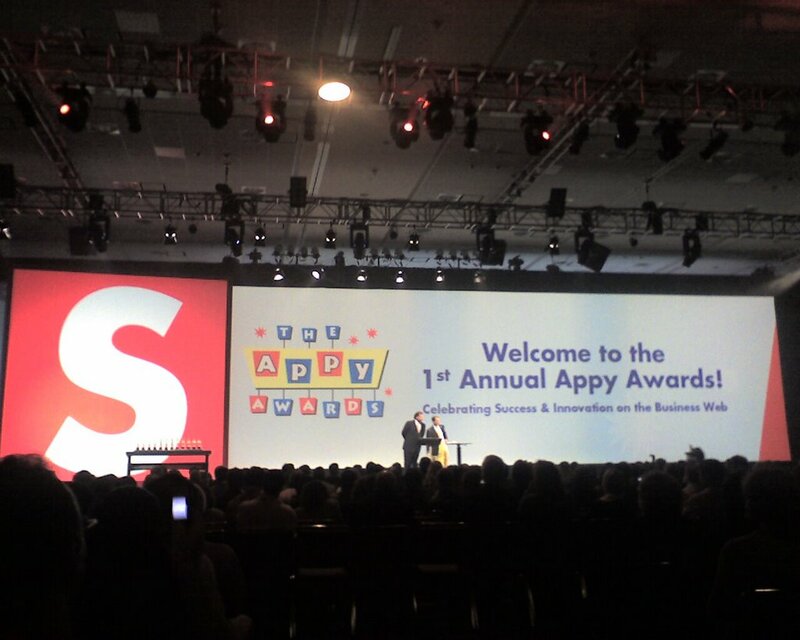 Since Benioff and Powell ran so long, the general session went over by 45 minutes and people were walking out. Most of these "demonstrations" felt like sales pitches, but I liked seeing the real-world examples. 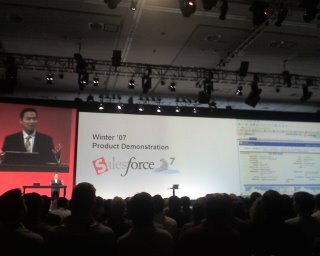 ModelMetrics - Thanks Adam for referring me to another vendor when I described the Salesforce customization I was looking for. Before the Call - Really good bunch of folks offering instant access to a free version of their product. They also gave away a pair of tickets to the Oakland game that sadly I did not win. Convenos - thanks for the Skype headset, and for clearly and concisely explaining your product without being pushy or salesy. 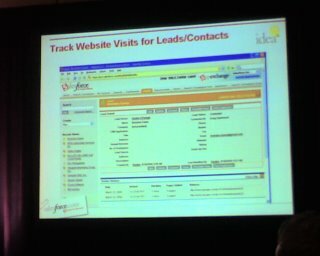 Salesforce - I had a specific question about Apex that nobody seemed to be able to answer but within minutes of leaving the booth I was on an email chain that had multiple people trying to track down an answer for me. The booth poor conduct award goes to Eloqua: their team of hyper-aggressive salespeople wouldn't let you past their booth without several calls of "can I scan you?" from multiple people. Sure you got my contact information and already sent me an email, but you left me with a poor first impression. A couple of pictures from today, all photos can be found on Flickr, tagged as Dreamforce2006. 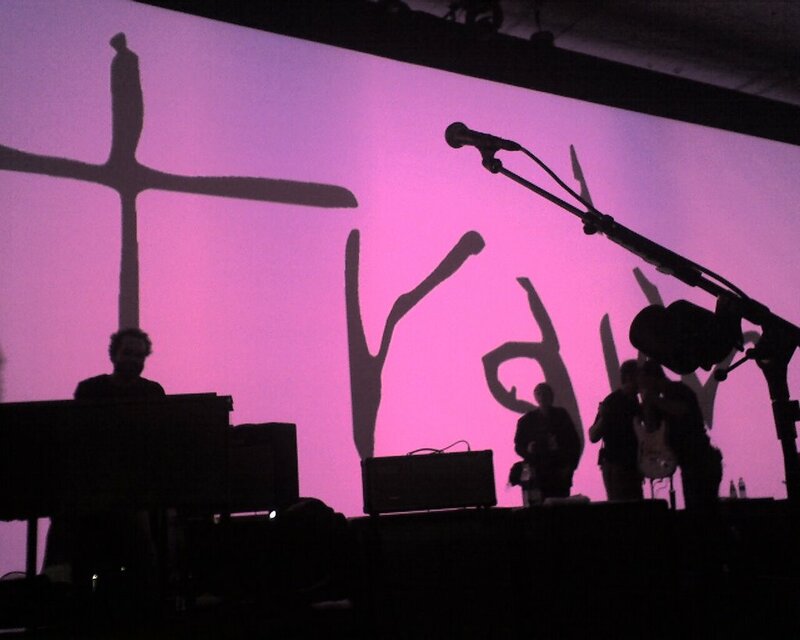 Other folks have added pictures to the dreamforce pool. Finally, a special thanks to Kingsley Joseph of The Successforce Blog for reaching out to me and inviting me to a have a beer with some other Salesforce Bloggers. Marc Benioff certainly has a flair for the dramatic. Next up was a brief and difficult to understand presentation by Cisco VP Laurent Philonenko, followed by Benioff back on stage to make a suprise introduction of Michael Dell. 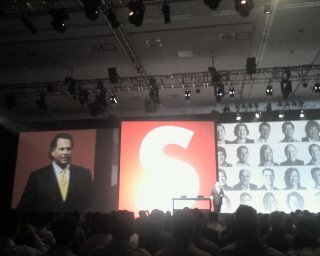 Dell came up on the video screen remotely and began congratulating Salesforce on the launch of Apex a tad prematurely. I know I hadn't heard anything about Apex yet and was puzzled. After some slides on PRM, Benioff and Co-Founder Parker Harris made the big announcement that Dell alluded to earlier - Salesforce Apex. Apex has the potential to be even bigger than the appexchange, giving developers and users the power to build completely custom code and applications on the Salesforce platform. 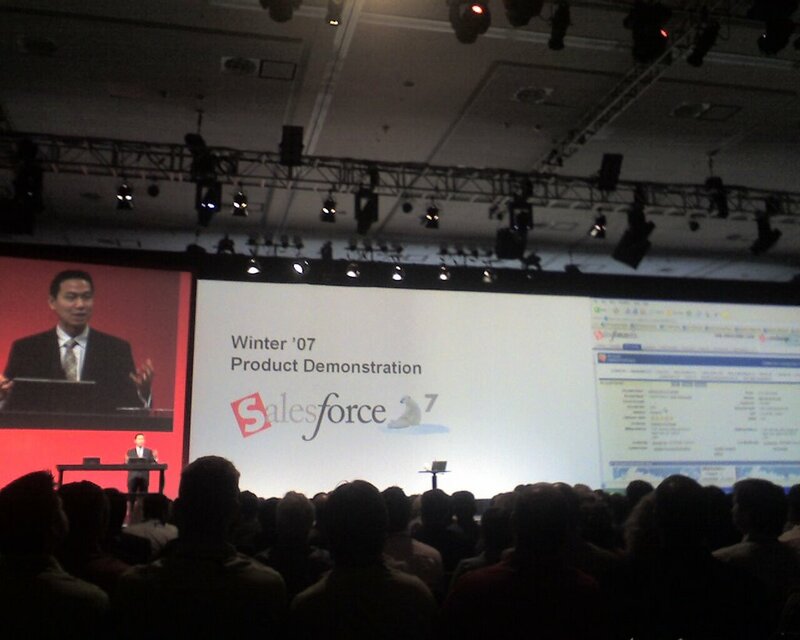 Salesforce hosts it and provides the infrastructure, allowing customers to focus on creativity. 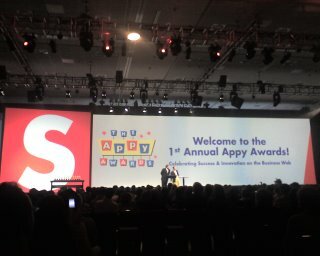 One final note on the keynotes - I thought it was very cool that Salesforce leased the old Siebel building ("We got a good deal, quipped Benioff") in San Mateo and is converting it into an AppExchange incubator. For $2k per month you get a cube and access to help, resources, and potential VC interest and develop a business to plug into SalesForce. That concludes the Keynotes, the rest of the day was spent at breakout sessions, the best of which was the live workshop that walked through a hands on demo of the new winter 07 features. 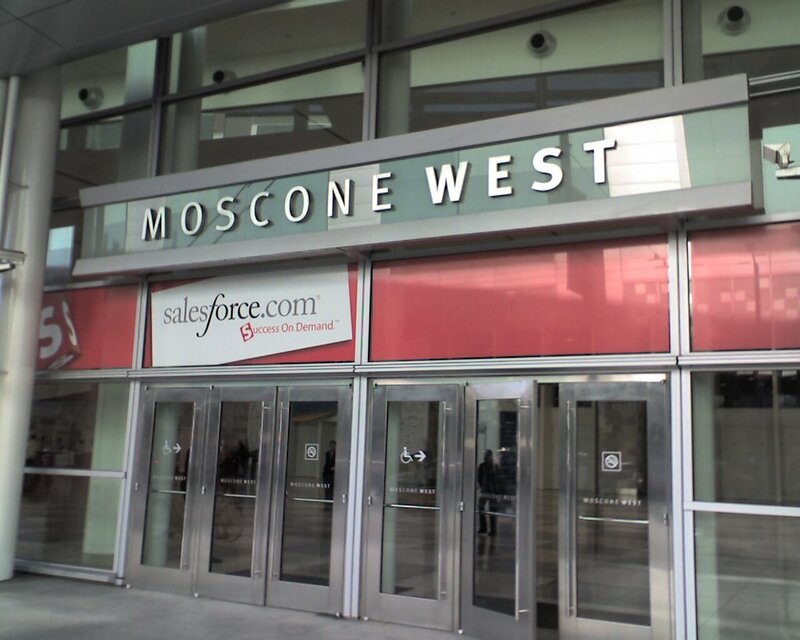 For more coverage of the keynotes check out PerspectivesOnSalesforce and SalesforceWatch. I headed back to the Moscone center around 8pm for the "Global Gala" with the band Train. I'll admit, I'm actually a fan so this was a nice surprise. I assume corporate events are just about the last thing a serious musician wants to do but they were really good and the crowd was actually really into them. "in-line S controls" - while I don't fully understand this, what I gather is that we can incorporate outside functionality within Salesforce, which could be huge. Widgets - have I ever mentioned how much I dislike this word? Anyway, widgets are here to stay.